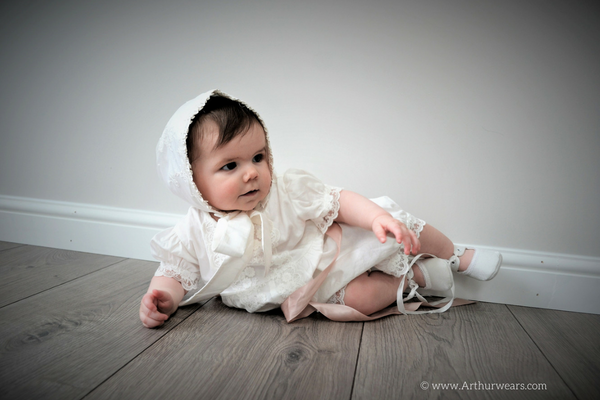 Last week we celebrated Charlotte’s christening day. 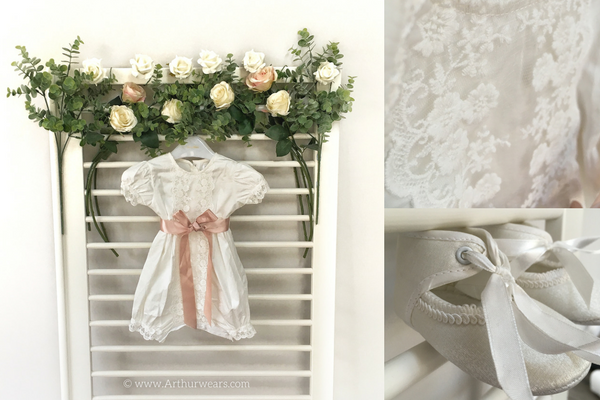 Unlike Arthur’s christening which we had planned meticulously for months in advance, the day this time around just sort of sprung itself upon us and we were still trying to figure out what we were doing about setting up the venue for afterwards and sorting out food in the morning! 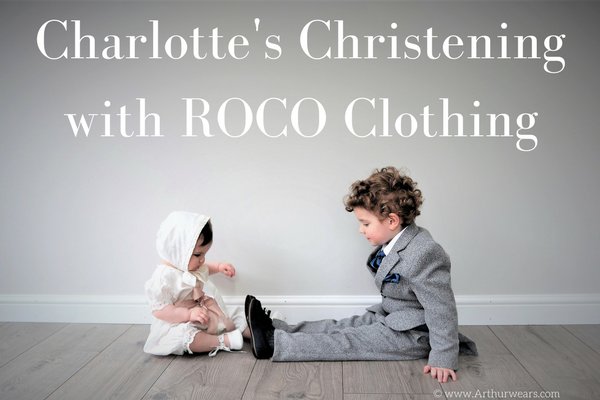 During the ceremony itself Charlotte wore the ‘family gown’ which her father and her brother both wore for their christening day, but this was paired with a bonnet and shoes from Roco clothing, plus a lovely little romper underneath once the gown was taken off. 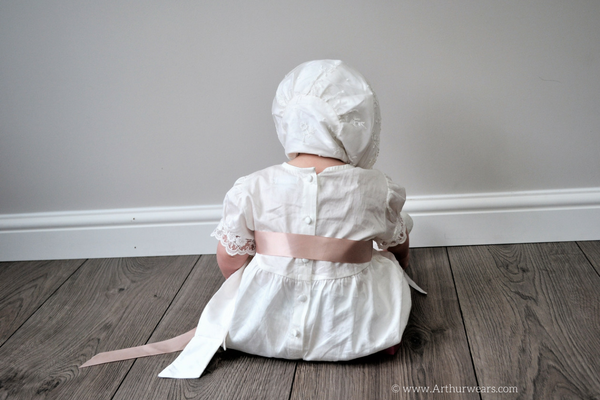 The romper is made from ivory cotton with lace at the front, ivory back buttons and a pink (champagne) satin sash. 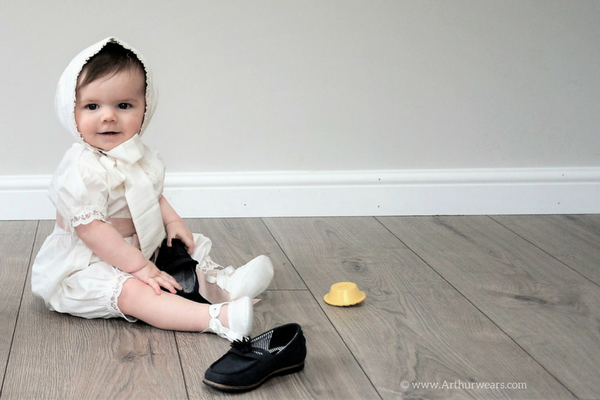 Her bonnet is 100% ivory silk dupion lined with a soft cotton lawn by Emile et Rose in the style 'Sienna', and her shoes are the baby girl's ivory christening shoes in style 'Libby', by Sevva in a canvas material. 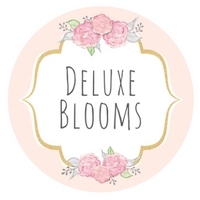 Originally I ordered her a pair of ivory shoes in the style 'Laura' on the website but when they arrived they were too small for her feet and they didn’t have any larger sizes. In the end I decided to buy her another pair of shoes from ROCO rather than pay the packaging and postage to send them back as I wasn't 100% sure on her size - I would say this was the only drawback about the whole experience as it wasn't clear how the sizes related to baby shoe sizes or foot measurements and I really had to guess based on my initial mistake - especially as Charlotte does have quite big feet!! 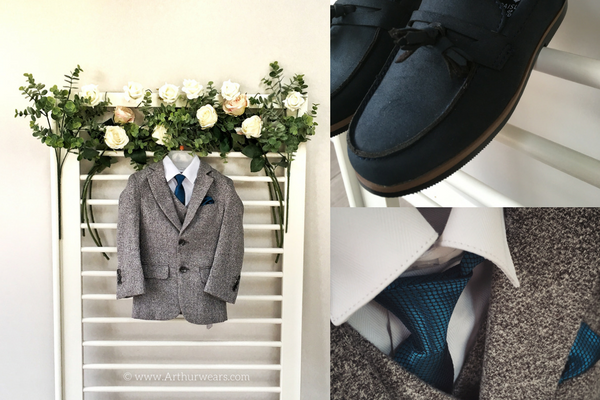 Although I was tempted to choose a suit with shorts for Arthur, I knew the April weather could be quite variable and perhaps a little cold so I chose this Light grey tweed wedding suit in the style 'Knox' by Paisley of London. 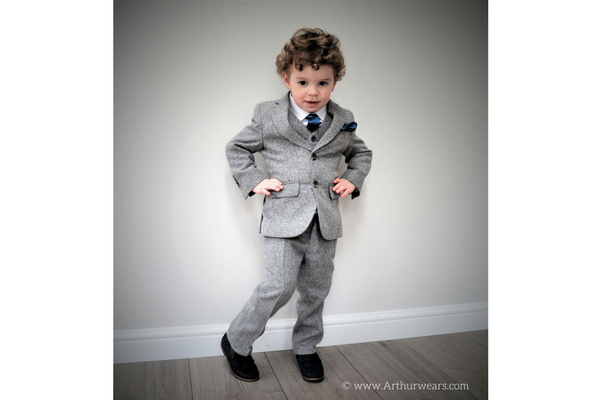 I'm not sure whether it was the little curly haired boy on the website who swayed it, but as soon as I saw this suit I knew it was the one for Arthur! 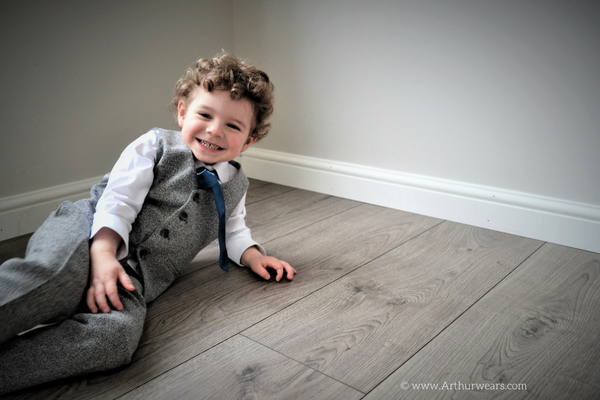 Arthur actually loved the smell of these shoes ( I know, 3 year olds can be strange!) and they were a lovely style. 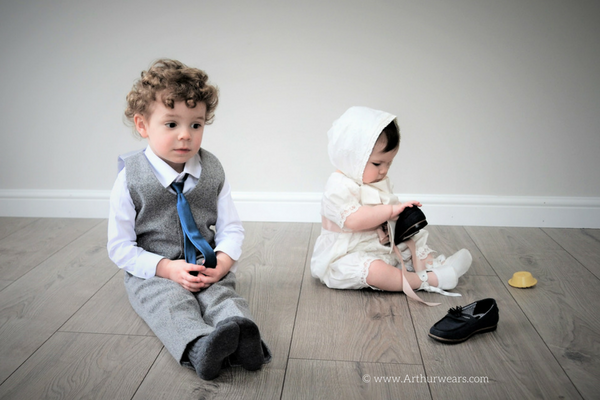 My only issue with the shoes which we didn't realise until the morning of the christening was that the insole for one of them had been glued in wonky and so you could see the lining on one side at the bottom and it wasn't completely smooth. 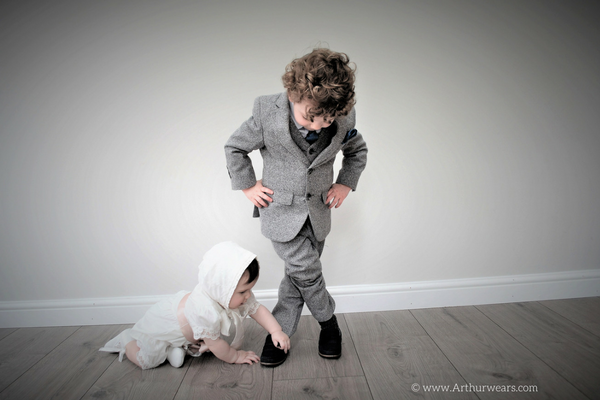 It was too late to do anything about this, but luckily Arthur didn't seem to notice. Both deliveries from ROCO clothing - the original order and the replacement shoes - arrived really quickly and I was sent an email in advance to let me know when my order would be arriving with the postman which was really helpful! I am so pleassed with the outfits for both of them, they looked lovely on the day and everyone complemented their outfits! I would definitely use ROCO clothing to order outfits for the future. 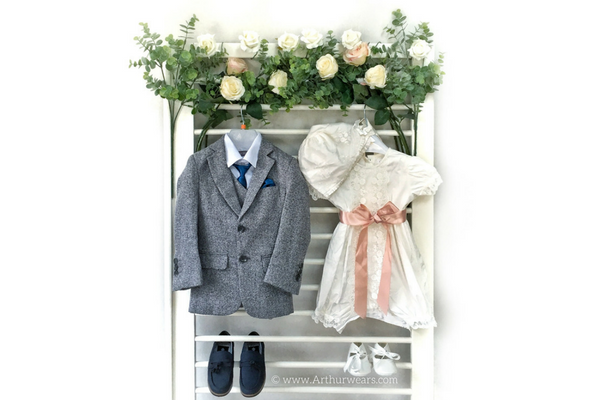 We have a wedding to attend to next year which they will both need outfits for - I'm not going to lie, I'm half willing Arthur to stop growing just so that he can wear this suit again for that! 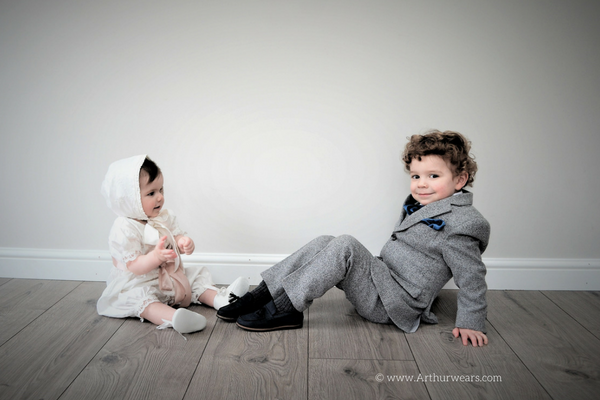 Disclosure: We were sent these outfits in return for an honest review. 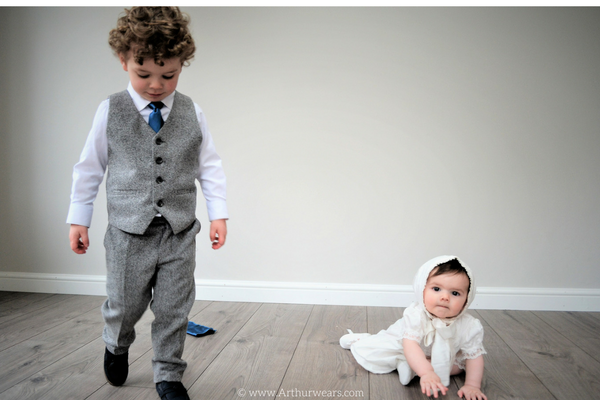 Oh my goodness - they are just adorable!!! 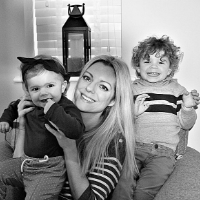 I don't think I have ever seen anything so cute!I've heard lots of good things about Roco clothing - now I know why! 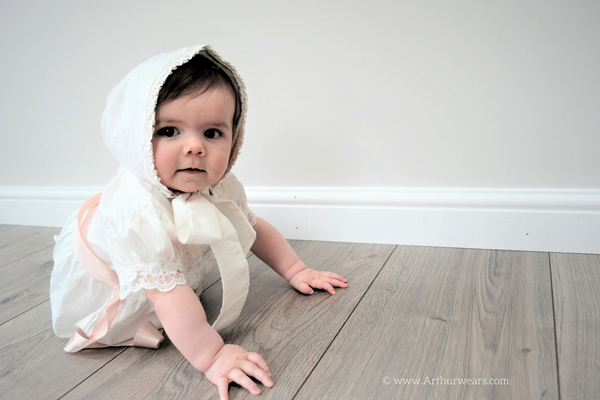 I loved the baby with her clothes, she really looks very beautiful ! !